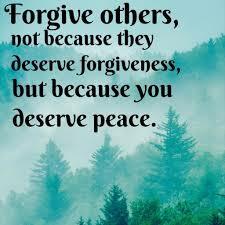 Forgive others because you deserve peace ! You can never be free of bitterness as long as you continue to think unforgiving thoughts. How can you be happy in this moment if you continue to choose to be angry & resentful? Thoughts of bitterness can’t create joy. No matter how justified you feel you are, no matter what “they” did, if you insist on holding on to the past, then you will never be free. 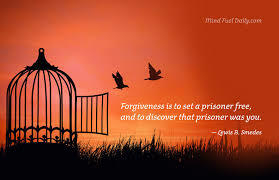 Forgiving yourself & others will release you from the prison of the past. When you feel that you’re stuck in some situation, or when your affirmations aren’t working, it usually means that there’s more forgiveness work to be done. When you don’t flow freely with life in the present moment, it usually means that you’re holding on to a past moment. It can be regret, sadness, hurt, fear, guilt, blame, anger, resentment, or sometimes even a desire for revenge. Each one of these states comes from a space of unforgiveness, a refusal to let go & come in to the present moment. Only in the present moment can you create your future. If you’re holding on to the past, you can’t be in the present. It’s only in this “now” moment that your thoughts & words are powerful. So you really don’t want to waste your current thoughts by continuing to create your future from the garbage of the past. When you blame another, you give your own power away because you’re placing the responsibility for your feelings on someone else. People in your life may behave in ways that trigger uncomfortable responses in you. However, they didn’t get into your mind & create the buttons that have been pushed. Taking responsibility for your own feelings & reactions is mastering your “ability to respond.” In other words, you learn to consciously choose rather than simply react. Forgiveness is a tricky & confusing concept for many people, but know that there’s a difference between forgiveness & acceptance. Forgiving someone doesn’t mean that you condone their behavior! The act of forgiveness takes place in your own mind. It really has nothing to do with the other person. The reality of true forgiveness lies in setting yourself free from the pain. It’s simply an act of releasing yourself from the negative energy that you’ve chosen to hold on to. 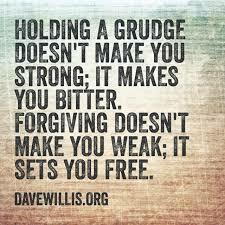 Also, forgiveness doesn’t mean allowing the painful behaviors or actions of another to continue in your life. Sometimes forgiveness means letting go: You forgive that person and then you release them. Taking a stand and setting healthy boundaries is often the most loving thing you can do—not only for yourself, but for the other person as well. Today I listen to my feelings, and I am gentle with myself. I know that all of my feelings are my friends. I get the help I need, when I need it, from various sources. My support system is strong and loving. In Healing Sphere, Past Life Regression, Life Between Lives, Future Life Progression and Spirit Relese sessions are conducted by certified Past Life Regression/Hypnotherapy Therapist. The sessions are safe, peaceful and relaxing. The sessions are also conducted thru SKYPE / Google Duo. Appointment may be taken for booking a session.